Slacker Radio is an interesting hybrid music service. On the one hand, the free version—like Pandora—lets you listen to pre-made stations or create stations of your own based on artists, albums, or tracks you choose. When you create such a station, it’s populated with tracks that are supposed to be harmonious with the original selection. If you purchase a Slacker Premium Radio subscription for $10 per month—as with such subscription services as Mog, Rdio, Rhapsody, and Spotify—you additionally have the ability to play songs, albums, and single-artist stations on demand as well as cache albums and playlists on your portable devices (including iOS devices). As such it can be quite flexible, though it has some rough edges. 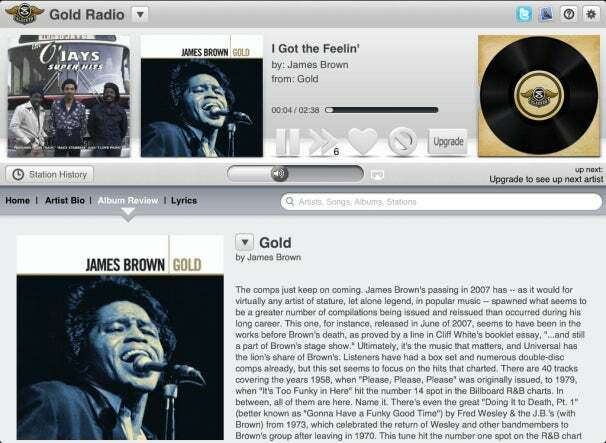 If you’re familiar with Pandora, you understand the idea behind the free version of Slacker Radio. 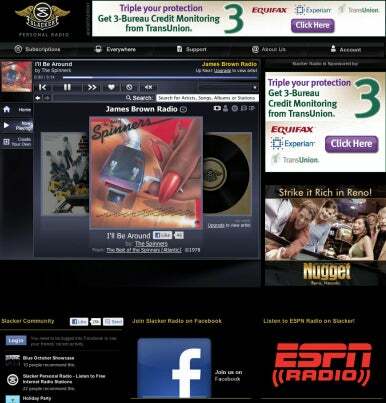 While listening to music, you must put up with the occasional audio ad (or video ad if you listen via the website). In my tests I heard ads after every fourth or fifth track. The ads aren’t terribly long, but they certainly disrupt the musical mood. With each station, you’re allowed up to six skips an hour (meaning you press the Next button to move to the next track in the queue). However, if you switch to a different station, you’ll have an additional six skips per hour. Pandora offers a somewhat similar scheme, but limits you to 12 total skips across all stations per day. Slacker doesn’t have a daily skip limit. 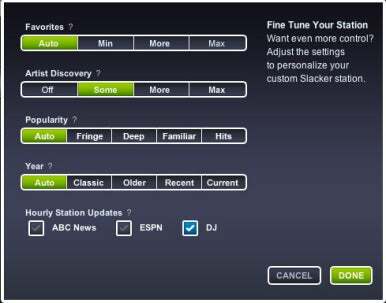 You have the ability to tweak your stations a bit when listening to the free version. You can, for example, choose broadly how often you want to hear tracks you’ve marked as favorites, whether you hear “greatest hits” or more obscure tracks, and choose older or more recent tracks associated with the source artist, album, or track. If you’re willing to cough up $4 a month for the Slacker Radio Plus plan, you can dispense with many of the annoyances of the free version. This removes all audio ads as well as banner and video ads on the Slacker website. The plan also provides you with unlimited skips. Additionally, you can cache mobile stations for those times when you’re not connected to the Internet. Choose this option and you can download the contents of a station to your iOS device or other device supported by Slacker (an Android device, for example). You can cache up to 25 stations. These downloads are of a lower bit rate than the 128-kbps MP3 tracks the service streams. Slacker Radio Plus additionally gives you access to ABC News and ESPN Radio content and provides complete song lyrics where available (not all labels allow lyrics distribution). Slacker Premium Radio is the plan to pick if you want to choose specific music—a track, album, or a station that plays music from just a single artist. In this regard, it’s like the premium subscription music services I mentioned earlier. This includes all the perks of the Plus plan, and you can cache entire albums and playlists you’ve chosen, as well as create playlists. The cached content is regrettably still offered at a low bit rate—a form of AAC encoded at 64 kbps. You can cache content on only one device at a time—if you choose to cache content on an additional device, any content on the first device will be erased. Slacker offers more than 10 million tracks for station streaming. However, the number you can play on demand is smaller. I compared some of its on-demand selections with the same tracks on Rhapsody—the service I’ve found that offers the most complete music catalog. In some cases, I found Slacker wanting. I searched for Nick Lowe, for example, and while his entire selection of albums appeared in the results, nearly all of their tracks were unavailable for on-demand streaming. The service told me that they could be included as part of a broader station, and asked if I would like to create such a station. Rhapsody, on the other hand, had these tracks. I then perused Jonathan Coulton’s albums. Slacker listed his Smoking Monkey album but offered no tracks for on-demand listening. Rhapsody had them in playable form. When searching for Ludwig van Beethoven on Slacker, no albums appear whatsoever (though you can stream select “songs”). Rhapsody had dozens of albums of Beethoven’s work. I very much enjoy the work of Bleu, a pop songwriter/performer. Slacker lists his work, but no available tracks. Once again, Rhapsody came through with the complete catalog. This is all about the licensing deals Slacker has struck with the labels. In some cases, a label will allow you to stream an artist’s work as part of a station but won’t allow you to download it. For example, if you create a Beatles station, you’ll hear Beatles tracks even though you can’t cache those tracks. Of course, there are plenty of albums that Slacker does have. If you want the work of mainstream popular, rock, country, soul, hip-hop, and jazz artists, you’ll find it. It’s when you dip into more obscure artists or the classics that you come up empty. Speaking of the classics, Slacker touts its use of professional DJs for selecting songs that populate its stations. And it should, as some of its programming is quite good—particularly popular hits of the past several decades. But it’s not good across the musical spectrum. Its classical programming, for example, is awful. I understand that “art” music isn’t a favorite among Slacker’s audience, but what the service currently offers is embarrassing. Not only are there only three classical stations that largely offer the over-played hits of the Baroque and Classical periods, but even when you create a station around a composer who epitomizes a rich subgenre—J.S. Bach and the Baroque period, for instance—Slacker can get it terribly wrong. Not only did I hear soupy hits from a good 150 years after Bach’s death mixed in with my Bach station, but also selections from Jesus Christ Superstar and The Music Man. Pandora does a far better job with classical music. I like the idea that you can tweak what you hear on Slacker by not only listening to the work of just a single artist (available in the premium plan) but also configuring settings so that you hear more obscure tracks. This feature needs a bit more work, however. I tested it by asking Slacker to play “fringe” recordings by James Brown. It played “Make It Funky,” “Prisoner of Love,” “Lost Someone,” “Mother Popcorn Pt. 2,” “Talkin’ Loud and Sayin’ Nothing Pts. 1 – 2,” and “Please, Please, Please.” I’m familiar with the Godfather of Soul’s catalog and believe only two of these tracks border on obscurity—“Lost Someone” and “Talkin’ Loud and Sayin’ Nothing.” The others have all appeared on greatest hits collections making them anything but fringe. This is a case where better tagging by someone familiar with the artist’s catalog would pay off. The not-entirely-dirty-secret of music subscription services is that navigating them via a Web browser is clumsy. Slacker is no exception. Under the free plan, the Slacker site is painful to look at—it’s not unusual to find a couple of video ads and large image blocks. Even when you’ve paid to turn ads off, the look of the site is anything but sleek. In regard to the player interface, it’s crowded. Tracks are presented in a too-small area as album covers in a Cover Flow-like view. Play controls differ depending on the kind of content you’re playing. When streaming a station you find Back, Play/Pause, Next (Skip), Favorite, Ban, and Volume buttons. When using the premium plan to play on-demand music, the controls include Back, Play/Pause, Next, Shuffle, and Volume. Under the free plan, you can’t see the name of the next track in the queue (with a paid plan you can), however you can view a list of what’s already played. This is a great feature for those times when you’re not next to your computer, a song has played, and you want to know the name of the artist and track so you can explore further. The player also includes a search field for finding artists, tracks, and stations. And you additionally have access to artist biographies, album reviews, and lyrics (partial with the free plan and full with a paid plan). The information found in the biography and reviews sections can be quite good. The Slacker iPad app is everything the Web interface isn’t—it’s one of the nicest iOS players I’ve used. All the elements found on the Web page are here, but organized in a more accessible way. The iPad app also has a Cover Flow presentation of tracks as album covers, but you can swipe those covers to move from track to track. When viewing the Home screen you can easily access existing stations by category as well as create a new station or playlist with a tap. Tap a Station History button to view tracks that have played. The Artist Bio and Album Reviews button take you to the appropriate content and work with both the free and paid plans. Tap Lyrics with a free account and you see the first verse followed by a button that reads Upgrade Your Account For Full Song Lyrics. With a paid plan, you see the complete lyrics when available. Use the Search field to seek out artists, songs, albums, and stations. On the Play screen, tap on a downward-pointing triangle and you see these entries: Play Album (works with premium account only), Add To Playlist (another premium feature), Rate as Favorite, Ban Song, Ban Artist, Buy, View Album Page, and View Artist Page. When you tap the Buy button, the iTunes app launches and you’re taken to a page that features the track, ready to purchase. The iPhone/iPod touch version of the universal Slacker app lacks the room to cram all these features into a single screen, but they’re nicely arrayed among multiple screen that are easy to navigate. One difference: The iPad version allows you to stream Slacker over AirPlay, while the iPhone/iPod touch version doesn’t. It’s easy to get caught up in audio specifications—this service has a higher bit rate than that one and is therefore better—but it really comes down to the quality of the encoding and your equipment and ears. Next to other streaming services, Slacker’s 128-kbps MP3 bit rate—whether from the free or paid plans—is not impressive. Pay for Pandora’s $36-a-year Pandora One plan and you get a 192-kbps stream. (Its free stream is of a lower bit rate.) Mog and Rdio offer higher bit rates, and Rhapsody encodes in AAC—which is designed to sound better at lower bit rates like 128 kbps. Almost all services offer lower bit rates for files downloaded to a mobile device, but some provide the option to download higher bit rate files. I’ve heard rumblings of Slacker increasing bit rates in the not-too-distant future, but this is what they offer at the moment. Using my ears and some decent speakers rather than relying on specs, I found Slacker’s stream perfectly acceptable for non-critical listening—streaming cached files from my iPad over AirPlay less so. Most of these cached files lacked definition and some of the classical tracks sounded poorly encoded—featuring lots of flanging on the top end. And, as with other streaming services I’ve used, you hear gaps between tracks that, on a CD, flow into each other. You can look at Slacker from two perspectives—as a free or low-cost service that competes with Pandora or as a premium service that goes up against Rhapsody, Spotify, Mog, and Rdio. As a Pandora alternative it has some nice advantages, including the lack of a daily skip cap, the ability to somewhat fine-tune what you hear, the extensive biographies and album reviews, and the ability to scan back through your listening history. But some of its programming isn’t up to par with Pandora’s—the classical content in particular. Users who’ve tired of Pandora’s content should give Slacker a spin. Turning to paid plans, the Slacker Radio Plus plan has some good things going for it. As with Pandora One, you ditch the ads and can skip an unlimited number of times. The ability to cache stations is great as are the lyrics. But it would be nice if that plan also came with a higher bit rate stream, as does Pandora’s paid-for plan. As for Slacker Premium Radio, work remains to be done. If Slacker wants to compete with services like Rhapsody, Spotify, Mog, and Rdio, it needs a bulked-up music catalog. There are just too many missing tracks. That $10-a-month plan is even more difficult to justify when you consider that other subscription music services also allow you to create and stream single-artist and track-based stations. Before paying for Slacker’s premium plan, explore these other services. Each offers limited free trials.